Individuals and businesses with a heart for the community and helping others were among the 2018 award winners recognized Monday night by the Morrilton Area Chamber of Commerce. Among those honored were seven Youth Citizens of the Year, representing all of the high schools in Conway County: Faith Byers (Wonderview), Carolyn Hopkins (Morrilton), Sophia Isely (Nemo Vista), Bailey Roscoe (Sacred Heart), Jacque Wilson (Morrilton), Juleigh Wilson (Morrilton) and Bailey Wright (Wonderview). Brandi Cooper was named the Citizen of the Year. A native of Morrilton, she has been a small business owner in Morrilton for more than a decade. Her boutique, Merle Norman and More, has been recognized as a Gold Medallion Studio, the highest honor from Merle Norman. Her business serves as one of historic Downtown Morrilton’s anchor businesses. Brandi supports numerous community and downtown projects and events. 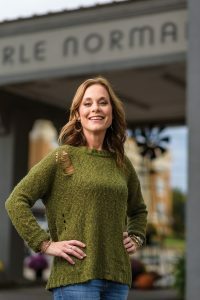 Her business is also an active member of Main Street Morrilton, and she has served as board president. She was an active member of the Morrilton Century League for many years and was a founding member of the Sacred Heart Catholic School Development Advisory Board. Described as reliable, enthusiastic and full of love for the community, Brandi is committed to the success of Conway County. Educator of the Year – Kara Jones. A member of the Morrilton Century League, she is also active in the community, helping to implement two food pantries at UACCM and one at Morrilton City Hall. She is also an avid supporter of Sacred Heart Catholic School and Church. A Morrilton resident, Charis is a drafting major at the college. Twenty years ago, she attended UACCM and dropped out. When she returned in the fall 2017, she had no idea what God had in store for her but knew she needed to return to UACCM and finish what she started. Charis is a Student Ambassador and president of the Drafting Club. She is also a member of Phi Theta Kappa, National Technical Honor Society and SkillsUSA. She plans to work as a drafter while pursuing an engineering degree and dreams of designing and building small, inexpensive homes for low-income families. Business Site of the Year – Big Cuppa. Since it opened, Big Cuppa has brought life back to Downtown Morrilton and created chatter all over town. This business has spruced up one of the city’s historic downtown buildings and has become a popular spot for all to meet, hang out or simply grab some joe and go! Success has granted them the opportunity to expand and have a second location at UACCM. While not an economic or employment powerhouse, this small, family-owned and operated business has made a true impact and left their “aroma” all over town. Community Project of the Year – Class A State Basketball Tournament Partnership with Wonderview and the South Conway County school districts. “The Class A State Tournament was a huge success for Conway County,” Wonderview School District superintendent Jamie Stacks wrote in her nomination. “It was a perfect example of collaboration, teamwork and support in order to accomplish a single goal: to provide an experience of a lifetime for every student who earned the right to be at the state tournament. Education Project of the Year – University of Arkansas Community College at Morrilton Workforce Training Center. The facility represents the largest construction project in the institution’s history and was made possible with a bond issue and private funding totaling about $2.7 million. In addition, more than $1 million in equipment has been donated. The 53,843-square-foot center, completed in the spring, is the new home for several of the college’s programs: Automotive Service Technology; Heating, Air Conditioning and Refrigeration Technology; Welding Technology; and Industrial Mechanics and Maintenance Technology labs. There is also space for specialized workforce training and the UACCM Workforce Development and Community Education office. The Workforce Training Center will serve as a premier training facility for Arkansas for many years to come. The state-of-the-art technology, increased space, environmental design and energy efficiency allow UACCM to provide innovative skills training in the high-wage, high-demand areas that promote economic vitality and workforce development in the region. Conway County Farm Family of the Year – Travis and Valerie Sims of Center Ridge. Recognized as a district farm family, Travis and Valerie raise poultry and cattle on 602 acres. They have four broiler houses that raise an average of 594,000 birds per year. A farmer his entire life, Travis was raised on a cattle farm and started his own operation in 1996 with the purchase of 90 acres. The couple have two sons, Will and Cordell, who attend the Nemo Vista High School. Chairman’s Award – Cody Beene. Selected for his outstanding service to students and citizens of Conway County, Cody was the driving force behind the Pathways to Opportunities Partnership (POP) with School Counts!, UACCM and Conway County schools where students can attend UACCM concurrently and take career/technical classes at no charge. The program not only benefits the students of Conway County, but should help the local economy. Cody’s vision and leadership played a key role in the development of this great program.